Many Adirondack camping resorts offer RV owners large and accommodating parking/camping sites – but there’s usually few trees around. Not at Lake George Escape. Many of our RV camping sites are located under leafy tree canopies, or near a creek or brook, giving you that just-hiked-into-the-woods Adirondack camping experience. From easy-access clusters, to drive-thrus and back-ins, we have a site that is perfect for you, your family, and your equipment. Regardless of which site you choose, you will enjoy the best of both worlds; A far from civilization feel just minutes from the excitement and activity of downtown Lake George. 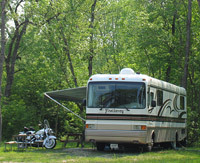 RV sites include water and electricity, and many of them featuring full hook-ups. And, because we’re 5-star rated, you camp with the assurance that our facilities are as impressive as our sites! RV sites start at just $27 a night.